Painting to See the Master | GetAlongWithGod.comGetAlongWithGod | A blog about discovering a God worth knowing. Last week I spoke about plein air painting. This coming weekend will be my second voyage into plein air. As I stated before, my focus will be different this time. I will be looking for the Master rather than focusing on creating a masterpiece. In that post, I spoke about the difference between painting in the controlled setting of a studio versus painting outdoors while vulnerable to all the elements. It’s no wonder why I prefer the safety and predictability of studio painting. It’s easier! And while I’m not guaranteed absolute painting success, I also don’t have things fighting against me. So how does plein air painting relate to my Christian life? A lot more than I care to admit. I can lay my Christian disciplines in a neat orderly row. Prayer time, church time, worship time, Bible reading time, fellowship time, quiet time… When I have all my ducks in a row, I feel quite good about myself. I can maintain a semblance of order. Externally I look great, but am I growing? And more than that, is the life of Christ being manifested? If I can maintain order myself, do I even need the life of Christ? Unfortunately, a pattern of habits and disciplines of order doesn’t make a way for the life of Christ. Self-regulation is just self-worship. Relying on my doings over God’s performance is just godlessness. For me, plein air painting relates to the vulnerability of a child, dependent on a Heavenly Father. Plein air, in this example, is like walking without the controls of the flesh, vulnerable to God. It’s living by relying on His life, His direction, and His choices. All the comforts of predictability, surety and climate control are in His hands. Abandoning yourself to His will and His ways is as much exhilarating as it is frightening. But untethered is the only way to experience Him in freedom. I know in my life I have attempted to put stops and limits to stay in control. When I can maintain a sense of order, I feel better about myself. But when I have cast myself on the mercies of God, then and only then have I experienced His overwhelming presence and deep intimacy. 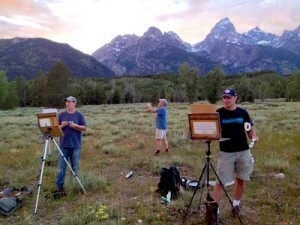 Sure, most of the people reading this blog will never attempt plein air painting. But we all were created to experience the exhilaration of living abandoned to our Lord. By design, we are made with spirits that function best when unmoored from flesh’s control. Relegating our Christian life to the safety of what we feel comfortable with makes for pretense not actual life. 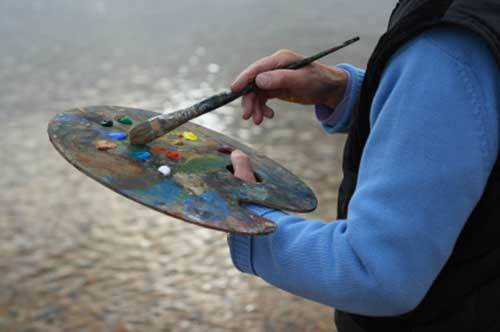 I’ll let you know how the plein air painting went, but more, I’ll tell you Who I met while plein air painting. Agreeing with Annalie, and tried to type on my phone,(yesterday) I am awaiting with great anticipation also to see how God reveals himself to you in your next “plein air painting’. I’ll be waiting and watching also!!!!! You touch on something I am expecting the Lord with wide eyed anticipation to show me: HIS order! I am bouncing up and down, tapping my feet in eagerness!